Have as much of a passion for food as we do? Say no more! Come and learn how to cook with Comyn Bruce. We can come to you or you can come to us. 1-2-1 tuition available all the way up to a cooking demo and dine party. The options are endless. You’ve done drinks parties to death. Time for a change! Gather your closest friends and learn how to cook together. Each person will have an element to cook to add towards the perfect canapé party, or a sit down dinner. Starting from 6 guests, you can decide how your evening runs. Keep it super simple, or more intricate. Please enquire for prices on cooking parties. 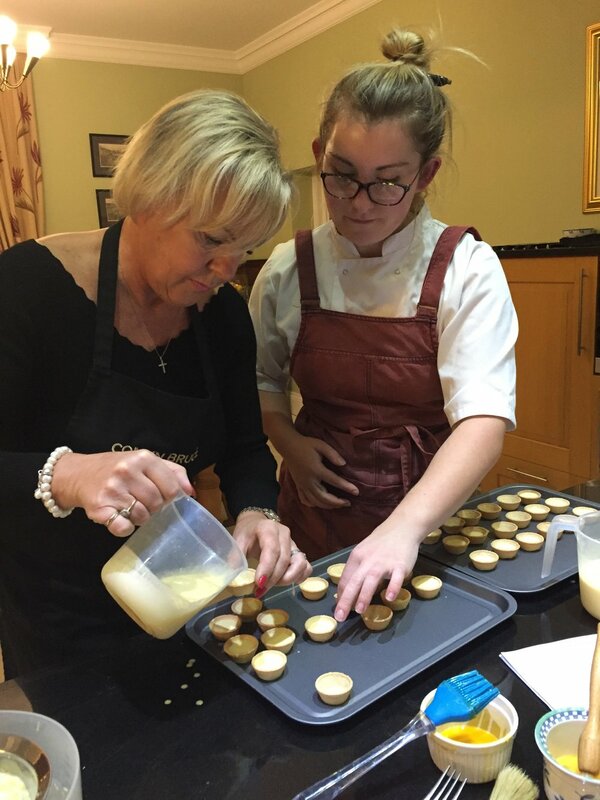 We can offer full tuition in pastry and desserts, fish, meat, supper inspiration, canapés, student basics, oriental cuisine, the choice is yours. Learn how to use cooking gadgets, budget meals, assemble the perfect dinner party and more. You can choose just what you want to cover in a 1-2-1 session! We can come to you, or you can come to us. Please enquire for prices on 1-2-1 tuition. The gift of food is always well received. Why not gift the skill of knowing how to make it! The gift that keeps on giving. You can purchase a 1-2-1 cooking lesson, set of lessons, couples lessons or even gift someone a cooking party. The best part is that they can choose what they wish to cook! By booking a set of lessons, you’ll also receive a discounted rate and an embroidered apron to take home! Maybe there’s a young person in your life whose cooking confidence needs a boost. Send them to us for a crash course in how to budget, shop, and feed themselves well. Please get in touch for prices on cooking lesson gift vouchers.